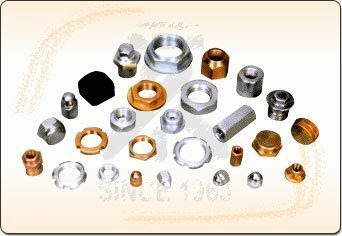 We are an ISO 9001-2000 manufacturers of all types of nuts like automotive nuts, nylock nuts, press nuts, hex nuts, coupling nuts and weld nuts. Our range of high tensile nuts or bolts assembly is an advanced version standard hex nut or bolt. Our range is a trouble free mechanical element and these can be tightened with tool wrench without much effort. While in the processes. such as assembly, dis assembly and reassembly. TNA helps to save labour and time. We are manufacturer of nuts (castle, slotted, nylock), high tensile nuts & bolts. Any special / custom size / designed as per specifications or drawing. Please let us know about any of your requirement on queries. Our range of products can broadly be diversified in the categories fasteners also delivered as per customers specifications. Quality is an inseparable part of right conduct and work ethics. We are one of the largest and leading manufacturers and exporters of premium quality industrial nuts, bolts & washers. These can also be availed in customized forms as per specifications and requirements. Our standardized and modified nuts and bolts productively meet the exact necessities of the industry and are known for their long lasting nature. We are dedicatedly engaged in manufacturing a matchless range of Hex Head Bolts (8.8) to our esteemed customers. It is precisely manufactured using high grade raw material that is sourced from known and verified dealers. This bolt is available in different sizes and can easily be used in various places. The precise screws easily fit into the nuts and it can also be customized as per the requirement of the clients. WE ARE ONE OF THE LEADING NAMES IN OUR FIELD,PASSING THROUGH SAME GLORIOUS PHASES OF SUCCESS AND DEVELOPMENT. WE ARE A MANUFACTURER AND EXPORTER OF ALL TYPES OF NUTS & BOLTS. WE HAVE ALL THE CAPABILITIES TO SATISFY ALL YOUR HEAT TREATMENT EQUIPMENT AND PROCESS REQUIREMENTS WITH THE LATEST TECHNOLOGY AVAILABLE AND AT COMPETITIVE COSTS.